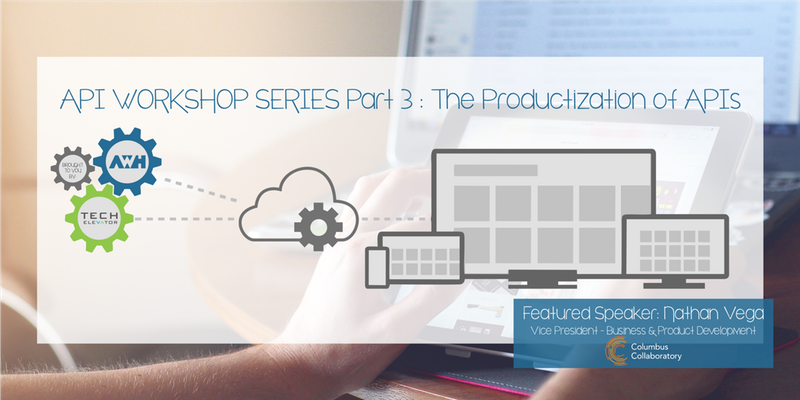 AWH and Tech Elevator invite you to the API Workshop Series – Part 3, The Productization of APIs. In this session, AWH founder and principal, Chris Slee, will discuss building APIs on microservice architectures using Azure and AWS. Come learn how Service Fabric and lambda can support the quick development of your API layer. In this session, Nathan will discuss Watson's journey from 2011 to the present. Chris Slee is the founder and principal of AWH, a Dublin, Ohio software engineering firm currently celebrating its 22nd year of creating great digital products for business clients. At AWH, Chris leads internal and external development teams across all applications, from web, mobile, and desktop platforms, to virtual reality and machine learning. Nathan Vega, a career technologist, left IBM after 15 years to join Columbus Collaboratory in 2016 to lead the product and business development practice. His responsibilities include new product development and go-to-market for cybersecurity and advanced analytics. Nathan was a leader in defining the Watson Ecosystem and the Watson Developer Cloud, the outcomes of which defined a partner engagement process and first-of-a-kind cognitive cloud platform that will power an era of cognitive applications built by IBM partners. Lunch and beverages will be provided. Free parking at the Rev1 Building.